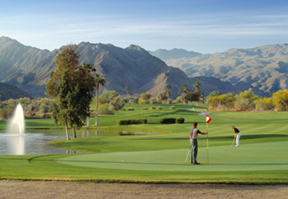 If you are looking for a desert home in a magnificent location where you can live and play, consider Ironwood Country Club. The Club is member owned and operated to insure continued improvement and quality throughout. Developed on approximately 800 acres, nestled within a cove bordered by rugged mountain terrain and offering down valley views, every location within Ironwood exudes its own individual charm. Membership in the Club is not included in the purchase of a home. Considering a new home in a secured environment, you owe it to yourself to research the opportunities of Ironwood Country Club. Let one of us be your guide to the experience you have always dreamed. Ford Properties is not an affiliate of Ironwood Country Club.